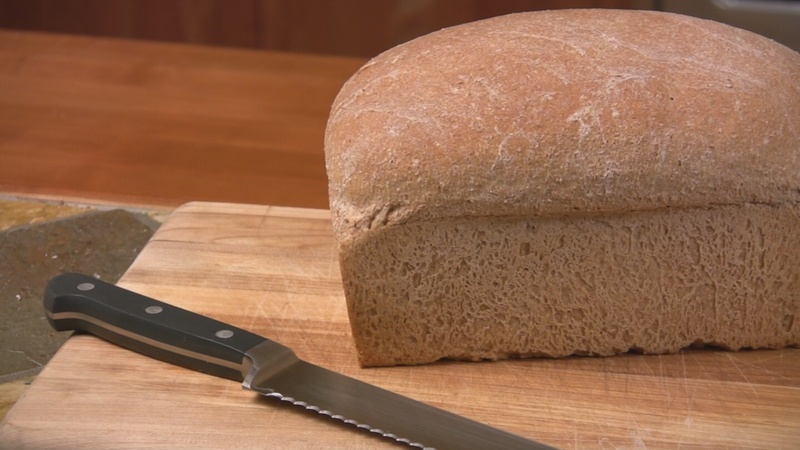 Make healthy, wholesome, and hearty whole wheat bread from scratch. Simple recipe with no special equipment needed. Mix water at 115 degrees with the yeast and sweetener and make sure it bubbles. This will take a minute or so. It is important to not go over 115 degrees as it will kill the yeast but too cool will slow down the process. We also do not put the salt and oil in at this time as they will inhibit yeast growth. Stir in 5 cups of flour until there are no lumps. Let stand for 30 minutes or until double in size. By only using the flour water yeast and sweetener we can optimize the environment for the yeast to grow. The metabolism of the yeast creates carbon dioxide which gets trapped in the strands of gluten formed by the wheat dough. Stir in the salt and oil and gradually add another 3 cups of flour. When the dough develops into a stiff ball, we are ready to knead. Turn out the dough onto a floured counter top and begin kneading. This is where technique and practice make a difference. The objective here is to slightly stretch the dough against the counter as the section furthest away from you is pressed back into the center of the ball. You will use about another half cup of flour to finish the kneading. The flour will be added very slowly. When the dough no longer sticks to the counter after a few kneads, you are finished. This will take between 10 and 20 minutes. Patience with your dough is important. Overkneading and tearing the dough will cause it not to rise well. This process develops that gas holding property of the bread even further. Oil the mixing bowl, put the dough in, oil the top and cover. Put on to rise for 45-60 minutes or double in size. If the room is cold, you may want to put into a warm (110 degree) oven. After the dough has doubled in size, you will punch it down to degas it. Lightly oil your bread pans. Cut the dough into two pieces. You can weigh for more uniform loaves. Form loaves by making a ball, pulling the sides into an oblong shape and then pinch the seams along the bottom and sides. Place in the pans, lightly oil the tops and set aside to rise for 30-40 minutes or double in size. Do not let rise for too long as that may cause the bread to fall or the top crust to separate. Bake at 350 for 45 minutes or golden brown. When the bread is finished baking, take out of the oven, let cool for 5-15 minutes and remove from the pan. Place on a cooling rack or the top of the pan. Your bread will keep for several days at room temperature, a week to 10 days in the fridge or a couple months in the freezer. Flour varies in volume so weight is more reliable. However using the absorption characteristic of the dough to determine completion is the most reliable way to have consistent results. Once the dough stops sticking to the counter after a few kneads, it is pretty much always finished.